The ever-popular Joss Cue has been made by Dan Janes, ACA hall of fame, and Joss Cues in the USA since 1968. Joss Cues use only the highest quality materials for their cues. Joss Cues’ price range is the most affordable of all high-quality cues made in the USA today. For more information about Joss Cues and Dan Janes, see below. 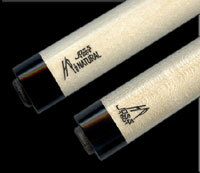 Joss LTD Cues - Joss Limited Edition Cues. Normally small quantity per design. Some models are one of a kind cues. Great for collection. Joss Cues On Sale - Save up to 25% off for these Closeout Joss cues. Some of these Joss cues come OB shaft or other shaft. a great buy. 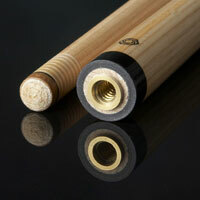 Promotion: Add an original black collar Joss shaft to your Joss cue order, add only $100. Limited time only. Promotion: Add a black ring Joss shaft to your Joss cue, add only $100. Limited time only. Joss Cues was born in 1968 in a two-car garage in Baltimore, the brainchild of Dan Janes and his partner. Working with one ancient manual lathe, a butcher-shop band saw, one drill press, and a single work bench, the two former road players took some of contemporary cue making’s first steps away from the traditional four-prong design, innovating the "floating points" concept and many others. Their unique ideas coupled with Dan’s personal relationships with the best players of the times including: Willie Mosconi, Steve Mizerak, Weenie Beenie, Eddie Taylor, Ed Kelly, Larry Lisciotti, Luther Lassiter, Jimmy Fusco, Richie Florence and Joe Balsis, just to name a few, helped make Joss virtually an instant success. Joss has remained at the forefront of cue making in the more than four decades that have passed. Dan started Joss Cues with a partner in 1968. In 1972 Dan took full control of the business and continues to make the original Joss Cue. He eventually moved to a new location and his son Stephen joined him in cue making. Dan and Stephen still work side by side in the shop while Debbie oversees the office and sales. Joss Cues is a real family effort that results in a company that cares about its product and clients. "The Color of Money"; even the cue passed off in the movie as a "Balabushka"
Dan has placed cues in the hands of many of the members of the BCA Hall of Fame (Mike Sigel, Eddie Taylor, Nick Varner, Jim Rempe, the late Jimmy Moore, Luther Lassiter, Minnesota Fats, Jimmy Caras and Joe Balsis), plus a roster of active competitors that reads like a who's who of pool. He has also made cues for Tom Cruise, Nicole Kidman, Paul Newman, Dustin Hoffman, Jimmy Connors and the entire starring cast of TV's Mission Impossible. And he's undoubtedly the only cue maker who can point to an appearance in the Mercedes Owners/Buyers Guide. 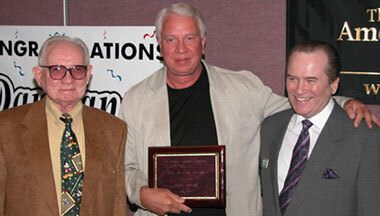 In July of 2003 Dan was inducted into The American Cue makers Association hall of fame. Dan takes the profession of cue making very seriously. Always looking for ways to improve the play and beautify cues while maintaining the traditional look and values of old-time cue making. His innate love of the game gives him a feel for what is important in each cue. His love of the game coupled with his penchant for detail makes him one of the top cue makers of all time.